The easiest way to issue and share a certificate. 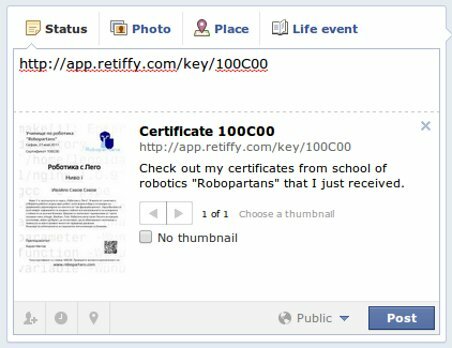 Retiffy started as a tool that automatically creates certificates in PDF format that we could print and give to our students in different IT courses we are organizing. In this early days our goal was just to make it easy for us to create the certificates instead of typing everything by hand. We saw that there is also potential for other organizations and we decided to implement Retiffy in a way that everybody could use and benefit from. It quickly became a platform for managing the certification process, promoting on the internet and reaching more people. referenced. An organization might issue certificates from a number of templates. Every certificate can be downloaded in a PDF format and then printed. When users log in they have all of their certificates in one place. Having the number, key of the certificate, everyone could check if this certificate is real, when and who issued it. Most of the time paper certificates and awards are put in a folder, in a wardrobe and forgotten about. Except for the siblings of the certificate owner no one sees them. 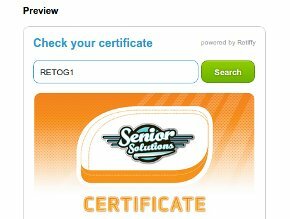 Certificates issued using Retiffy have a unique URL address. They could be shared on the Internet, in blogs, social networks like Facebook, Google+ or twitter, they could be embedded in sites. Their content is also indexed by search engines. After issuing a certificate an organization might decide to promote it. It is automatically send to the email of the certified person. She then decides if and how to share it. We do respect the privacy of every user and it should be up to them to share their certificates. All the shared certificates are seen directly by the certified person network of friends and the issuing organization becomes much more popular. Retiffy is a platform for the long term success of an organizations, businesses, schools or competitions. Certificates and awards are always issued and shared after the end of the competition or the course. They will be available even years later when people could again find you after stumbling on a certificate or award you have issued. Integrating and serving users visiting your site is also very easy by embedding a widget for checking the certificates and award directly on your site. You could find a short presentation of Retiffy In A PDF document that you could use offline. Retiffy was founded in 2011 and is currently part of Robopartans Group.